The Fellowes Quasar E Electric Plastic Comb Binding Machine is a compact, high performance binding machine that offers electric punching for the ultimate in convenience. In fact, all you need to do is push the button to punch! The Quasar E is a hard-working machine can easily punch up to 20 sheets of 20lb bond paper at a time and can bind documents as large as 500 sheets using a 2" plastic binding comb. The Fellowes Quasar E includes a vertical document loading slot that helps to ensure accurate punch alignment. The efficient design of this machine allows the user to punch and bind in a continuous manner for maximum productivity. The Quasar-E features a built-in comb storage tray with document measurement device for added convenience and quick set-up and an adjustable rotary edge guide centers documents with ease. Plus, every Fellowes Quasar E includes a binding starter pack to help you get started in binding your documents. Effortless electric operation - just push the button to punch!. Punches up to 20 sheets at a time. Binds up to 500 sheets with a 2” comb. Includes comb storage tray, document measurement tool, and binding starter pack (contents: 10 pk assorted kit). I am surprised at exactly how easy it is to use this binding machine. Our binding machine broke down and Amazon had this binding machine (Quasar E500) at a great price! The Office Supply stores carry them at a much higher price. We purchased 2 of the binding machines and they are working out very well. My manual pulsar 300 was good, but between my arthritic shoulders and the lever action, one had to go. The machine , unfortunately, or fortunately went. I chose the Quasar e 500 to solve the lever and shoulder concerns. Just tried it out, and completely recommend it over a manual. The torque of my shoulder and the old machine's lever were competing. The electric hole puncher makes perfect sense for an even moment arm (no pun intended). Very satisified with this product, just gotr it this week. For my work, it is nice to have a booklet that can fold flat. It make it easy to copy from and a nice handout for training and reviews. A lot pricier than the last GBC system I bought (manual) but the quality appears as good or better. Time will tell if it holds up as well as the GBC did. Welcome to MyBinding video. Let's take a look at the Fellowes Quasar E500, an electric plastic comb binding machine. As simple to use as it is good looking, this little plastic comb binding machine is perfect for the home and office for an all-in-one binding system. Let's go step-by-step. Step one is to set the side margin control. Use scrap paper to make sure you have the right setting for your size paper. If the punch pattern is where you like it, let's begin with the project. Starting with the covers, let's punch facing out. If you start facing out, you need to punch the whole project facing out. The Quasar E500 can punch up to 20 sheets of 20lb paper per punch. So use your entire project in batches of 20 sheets or less. When all your pages are punched, organize your book in order; it's time to bind. Always keep the teeth of the comb faced up and the project faced down. That way the project does not come apart in use. The lever on the left-hand side opens the teeth of the comb. Open it just far enough for your project. And then drape your project face down, thread all the teeth through all the holes, and close the comb. Lift it up and out, and you're all set. A small tray on the right hand side is used for comb storage and helping in comb selection. Also, there's the chip tray, you recycle the chips from here. And that is the Fellowes Quasar E500. For more demos, reviews, and how-tos, check out MyBinding.com. 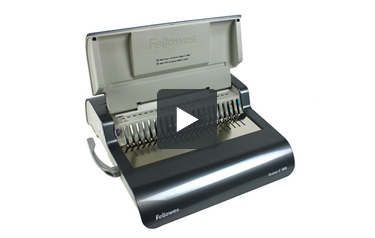 The Fellowes Quasar E is a full featured electric plastic comb binding machine. It is the electric version of the Quasar-500 manual plastic comb binding machine. The Quasar-E offers the same stylish design used in the Fellowes Starlet, Star, Pulsar and Galaxy line of comb binding machines. This machine is designed for use with almost all the available sizes of plastic binding combs. It can bind documents with just a few sheets, documents that are 2 inches thick and everything in between. This means that it can be used with both round plastic combs and oval combs. The Quasar-E binding machine offers a wonderful contemporary design that allows users to fold the machine flat when it is not in use. The combination of dark gray and silver used on the machine help it to blend in with other office equipment such as desktop printers. It includes a convenient push button punching control and an integrated storage tray / spine measuring device. This machine is capable of punching up to twenty sheets of 20lb paper per lift. That is a respectable punching capacity for an electric comb binding punch. The twenty sheet punching capacity combined with the convenient electric punching mechanism makes this machine an excellent value. The comb opener on this machine is capable of binding virtually any size of plastic comb available on the market. It can be used with combs as small as 1/4" and as thick as 2". It can open smaller 3/16" plastic combs. However, this machine is not recommended for use with 3/16" combs since it does not have an adjustable depth of punch margin control. The vertical punching slot and rotary side margin control make this machine easy to use and set up. Documents can be aligned by simply drop the pages into the slot and tapping them into place against the side margin control. The push button punching control is then conveniently located on the right hand side of the machine. The Quasar E is capable of binding letter sized documents with both small and large plastic combs. However, it is not designed for binding documents that are shorter or longer than eleven inches. It can be adjusted for use with oversize clear covers but it can not be used for legal sized paper (24 holes), A4 size (21 holes) or half letter sized documents (15 holes). Users who need to bind these different sized documents will need to choose a machine that offers an open throat design with disengageable punching pins. The storage tray on this machine is useful for measuring your documents and measuring the size of spines that you have on hand. However, tray doesn't hold enough combs to make it very useful. It would have been better to use the space to make the chip tray larger instead of offering storage for a few dozen combs. Although this machine offers a stylish design that will fit well inside an office environment, it is made primarily out of plastic. This should not be a problem for most office environments. However, heavy users and production environments should consider a more industrial machine with all metal components. The Fellowes Quasar-E is an excellent choice for users who are looking to purchase a full featured electric plastic comb binding machine for use in a medium sized office. It can bind both thin and thick documents using plastic combs and is exceptionally easy to use. However, it is not a good choice for users who need to bind documents that are longer or shorter than eleven inches. It is also not designed for high volume production environments. Dimensions 5.12" x 16.87" x 15.37" 6.5" x 19.62" x 17.75" 6.5" x 21" x 17.75" 5.12" x 18.12" x 15.37"